After headlining the Impericon Never Say Die! 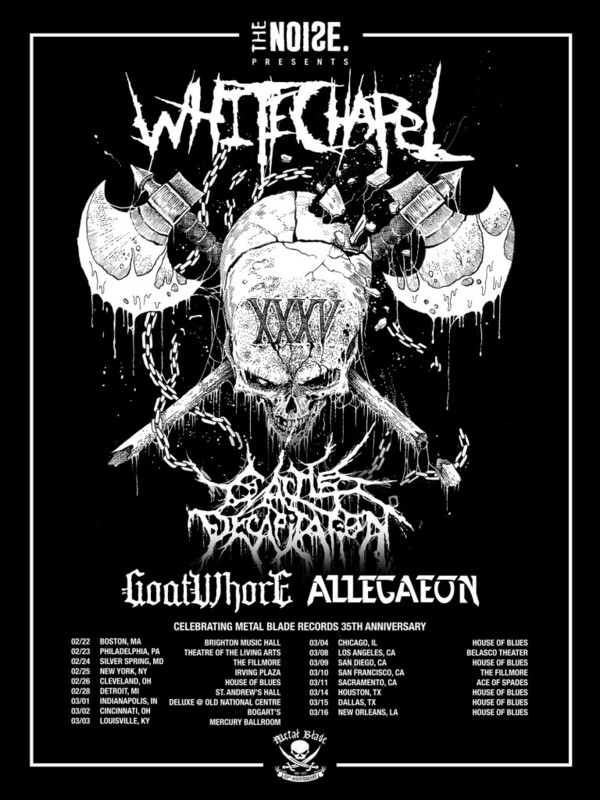 European tour with Thy Art Is Murder, Carnifex, Fallujah, and more last month, WHITECHAPEL is ready to head out on the road again, in support of their new album, Mark Of The Blade. Hailed as “an exciting milestone” by AltPress, Mark Of The Blade sees WHITECHAPEL redefine who they are and what they are capable of with 11 tracks that leave a distinct impression on every listener. To view the band’s “Bring Me Home” video and to purchase the record in various formats – visit: metalblade.com/whitechapel. CATTLE DECAPITATION recently joined forces with Brujeria for a UA tour in support of their most recent full-length, 2015’s The Anthropocene Extinction. As the most sonically and thematically engrossing record of CATTLE DECAPITATION‘s maniacal discography, The Anthropocene Extinction was named one of the best albums of the year by Loudwire, MetalSucks, and MetalInjection, among many others. To preview and purchase the acclaimed The Anthropocene Extinction, visit: metalblade.com/cattledecapitation. Currently on the road with Crowbar following a crushing Ozzfest performance, GOATWHORE is currently finishing up work on their seventh studio album, which was recorded and is being mixed entirely in analog format. Their previous record, 2014’s Constricting Rage Of The Merciless, was crowned their most, “varied record to date, as well as their strongest,” by Pitchfork and, “unrelentingly pummeling and brutally oppressive,” by PopMatters. Constricting Rage Of The Merciless can be previewed and purchased at: metalblade.com/goatwhore. Since the release of their new album, Proponent For Sentience, this past September, ALLEGAEON has shared the stage with the likes of Black Sabbath, Disturbed, Megadeth, and more at Ozzfest Meets Knotfest, as well as joined labelmates Battlecross and Necromancing the Stone for the annual Winter Warriors Tour. To preview and purchase Proponent For Sentience – a musically complex, intelligent, and absorbing concept album – visit: metalblade.com/allegaeon.